Part of an 18 acre park development with ball fields, ADA compliant playgrounds, a water play area with sprayers and soft surface, the new 30,000 SF Community Center includes lobby, reception center, full kitchen, meeting rooms, and hardwood athletic courts/gymnasium with electronic scoreboards and motorized bleachers. The building has a standing seam metal roof, curved exposed roof trusses, exposed tongue and groove ceilings, slate cladding on the exterior and meets the LEED™ Silver standard. A rooftop photovoltaic system reduces the electrical use of the facility and large windows let in natural light. 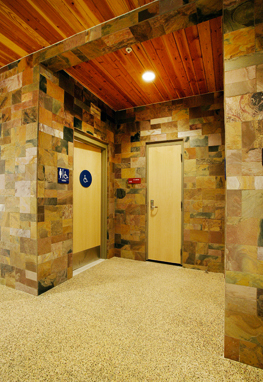 The building incorporates the colors of the surrounding hills and was completed in twelve short months from contract award to completion. Kevcon was prime contractor on the Community Center and subcontractor to Park West Inc. who was the prime contractor on the overall park development.